We are at the end of July but it seems Junglee Rummy is just opening their load of promotions now! This time, Junglee Rummy, one of the fastest growing online rummy website from India is making the headlines with one of the newest type of promotion. 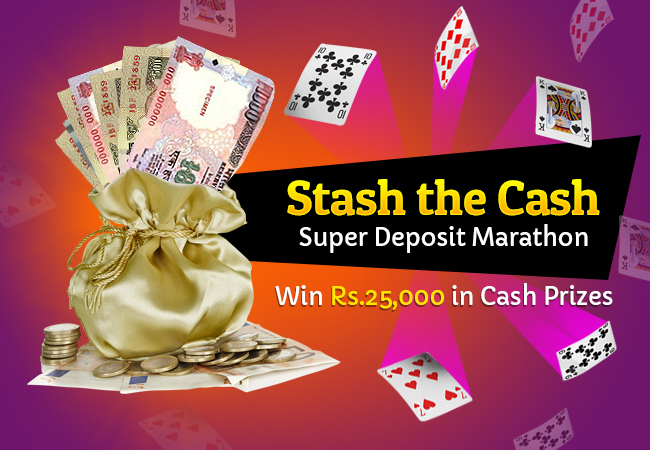 Named as Stash the Cash, this is one of the biggest online rummy deposit marathons we have ever seen. The maximum you deposit in the promo period, the maximum is your chances to lead the leaderboard and win guaranteed prize money of up to Rs.25,000. Stash the Cash promotion has begun today, 28th July 00:01 hours and will end tomorrow, 29th July at 23:59 hours. So, if you have an account in Junglee Rummy, it is your best opportunity to deposit cash and also win some cash for depositing. You can always check out the leaderboard to know where you stand among other players who have already deposited. Please note, in order to get the prize money, you should be among the top 6 players by the end of the deposit marathon, Stash the Cash. Also, you are not allowed to withdraw your cash that you have deposited during the deposit marathon promo period. Doing the same, will disqualify you from the promotion and you won’t be eligible for the guaranteed prize money of Rs.25,000. To know more about the promotions this big and great, visit our News and Promotions category. You can read the best reviews on top online rummy promotions from websites like Ace2Three, Classic Rummy and more. Also, don’t forget to comment your views in the comment section below!